The Fluidampr viscous torsional damper is an essential component in building a high performance 3.0 V6 TSI Supercharged Audi/Volkswagen engine. No viable solution for crankshaft pulley upgrades in the future. When faced with these problems, we took everything we learned from the industry & the Audi community and went back to the drawing board. How do we design a damper that will be a viable replacement to the OEM (Part #) as well as be a modular design? 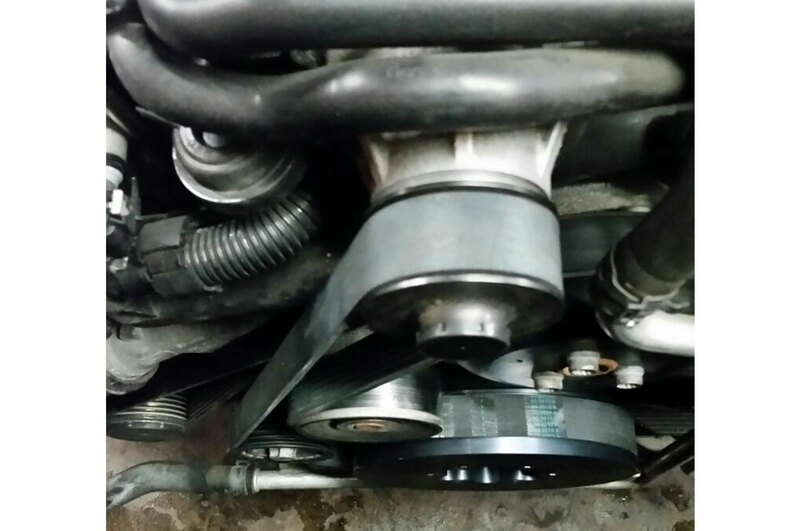 The main issue facing Stage 2+ owners was the inability to keep the OEM pulley intact. The rubber elastic ring holding the assembly together would either crack or completely tear apart resulting in the mass amounts of billet aluminum replacements being produced. Make no mistake , this is not a block of metal chewed out to have 13 grooves. After 10 months of engineering and prototyping we proudly present the world's first viscous torsional vibration damper for the 3.0 V6 Supercharged motor . 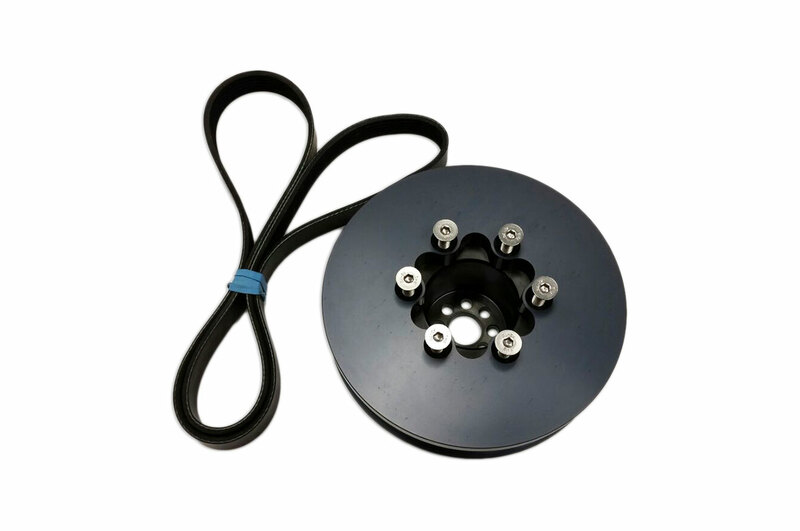 With its multi function design , a user once installing the Fluidampr can upgrade to a larger supercharger drive pulley in under 20 minutes. No longer the need to put the vehicle into service mode or change the supercharger pulley once the Fluidampr is installed.With the unique modular design users can go from Stage 1 to Stage 2/ Stage 3 dual pulley with a simple add on drive on pulley which mounts to the face of the Fluidampr via (6) countersunk socket cap screws. If custom size is selected , please include in the notes on check out what diameter you would like your custom pulley to be i.e. 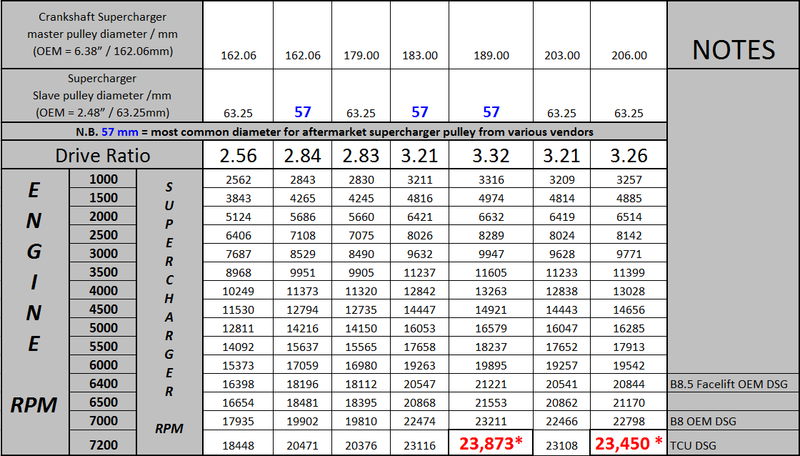 if 195mm is desired put "Custom - 195mm"
See table below to help you choose the best crankshaft supercharger master pulley diameter for your application. 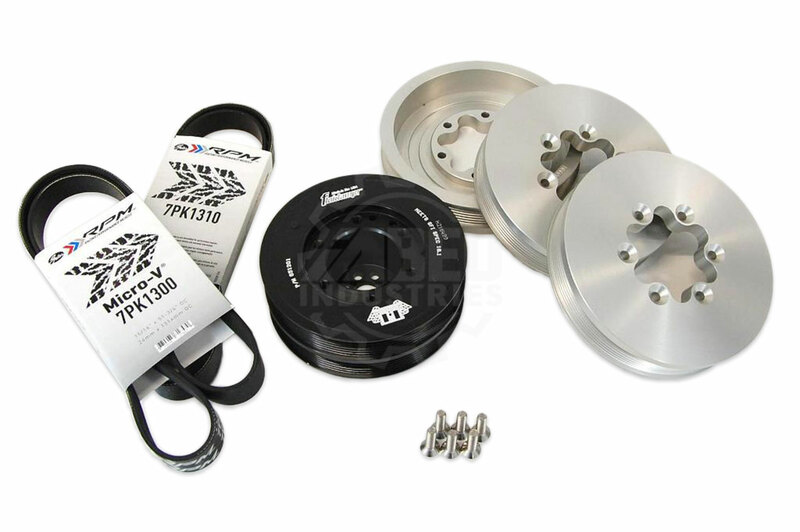 "I want an X Stage 2 dual pulley tune , I already have the Supercharger pulley installed previously from another vendor . What components do I need?" "I want an X Stage 2 dual pulley tune, I don’t have the supercharger pulley installed and am upgrading from a stock S4. What components do I need?" Components included when purchasing for Stage 2 or Stage2+/3/etc. 1. Install Fluidampr to crankshaft hub bolt as per OEM specifications. 2. Drive ring needs to be seated flush with the Fluidampr. Failure to do so will result in the belt walking off the Fluidampr/Supercharger. 3. 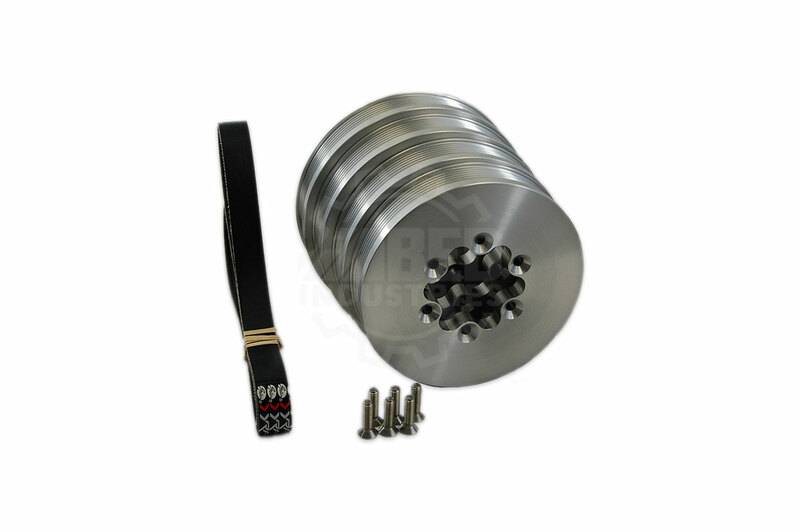 Torque the (6) M8 x 1.25 countersunk stainless steel (A2-70) socket cap screws to 22Nm. 1. Vdamper / iABED only inventories 179mm & 183mm add on rings. Any size different from this requires a minimum of 2 weeks to CNC machine , inspect & anodize. 2. 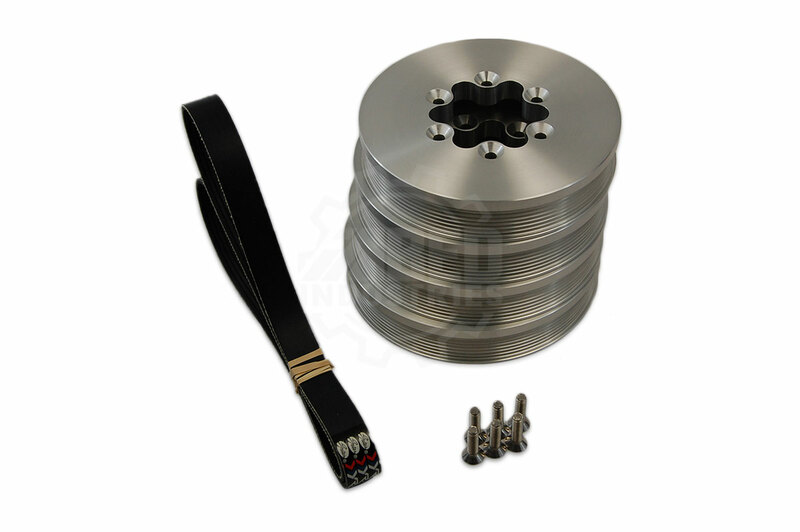 Selection of the supercharger pulley is for belt sizing only . 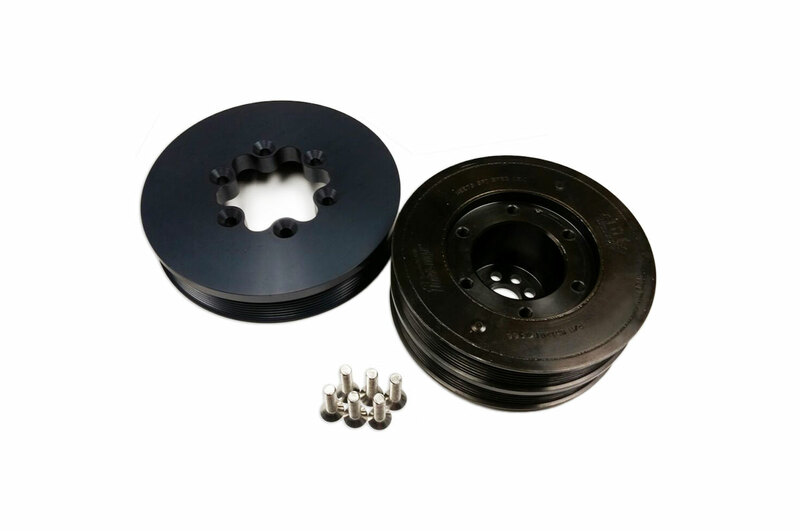 We do not sell Supercharger pulleys , the selection is only for us to supply you with the correct 7PK belt at the time of ordering. 3. 7PK Belts are extremely limited (Quality ones that is) in sizes over 1325mm . When ordering a 194mm ring or larger , your belt will be substituted to a trusted 6PK version similar in quality to the OEM Continental belt.